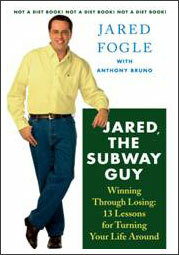 We missed Jared Fogle’s Rockefeller Center appearance, and Lord knows we haven’t read his new book. But we did just listen to his 13-minute interview with Leonard Lopate on New York public radio from earlier this week. (Scroll down the page for the Jared link.) It’s pretty run-of-the-mill stuff, although Jared does reveal that he only eats at Subway two or three times a week nowadays, mostly due to his hectic travel schedule. He also talks about how he came up with the Subway diet and how Subway got in touch with him to do the ads. Comically, he refers to his nationwide speaking schedule as the Tour de Pants, as he lugs along the fat pants and whips them out at unexpected moments to shock and amaze. (Kids “ooh and ahh” over them, apparently.) Toward the end, he doesn’t exactly give commercial actors the greatest compliment when he says of his career: “I always joke that I don’t have a real job and I don’t want a real job.” Now that’s biting the sub that feeds you.